Get 10 Free Personalized Holiday Cards + Free Shipping! Hard to believe Christmas is almost here! If you’re trying to stick to a budget and get everything done on your list, here’s a deal for you! This week, you can get 10 FREE personalized holiday cards from Vistaprint! Plus, you can even get free shipping on orders over $30. Choose from over 3,200 designs to find the perfect backdrop for your favorite photo of the fur kids, or your best family portrait. Hurry on over to Vistaprint.com and get 10 FREE cards now! Shipping is $5.50 or FREE with $30 purchase. 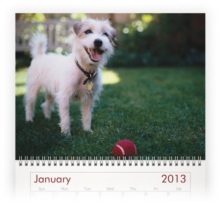 Free Personalized Photo Calendar from Vistaprint ($15.99 reg)! Get a FREE Photo Calendar and Save $15.99! Customize it with icons, text, photos and themed designs for a unique calendar. Make it for yourself or as a thoughtful and personalized gift! Add up to 13 of your favorite pet and family photos for FREE and receive in as few as 3 days! The calendar is FREE, just pay shipping and processing at around $5. Visit Vistaprint here to view close to 300 design options and create your free calendar! No Sunday Coupons – Check Out These Freebies Instead! Get a FREE Summer Drinks Recipe eBook from American Family! Free Issue of Bridal Guide Magazine – No Strings, No Bills, Courtesy of Start Sampling! Free Dessert or Appetizer when you ‘LIKE’ Chili’s on Facebook! Free Online Family Organizer Account from About One! Free 6-issue Subscription to Working Mother Magazine! No Strings, No Bills. FREE Back To School or Pet Calendar w/ 13 of Your Favorite Photos! Get organized and STAY organized with a FREE Photo Calendar from Vistaprint! Perfect for back to school or anyone with a busy schedule! Or make one with your favorite pet photos just for fun! Customize with a themed design template of your choice. You can also add text and icons to highlight your family gatherings, birthdays, anniversaries, school schedules and sporting events. Add up to 13 of your favorite photos for FREE and receive in as few as 3 days. 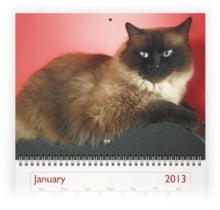 The custom calendar is FREE at Vistaprint, just pay shipping which is approximately $5!